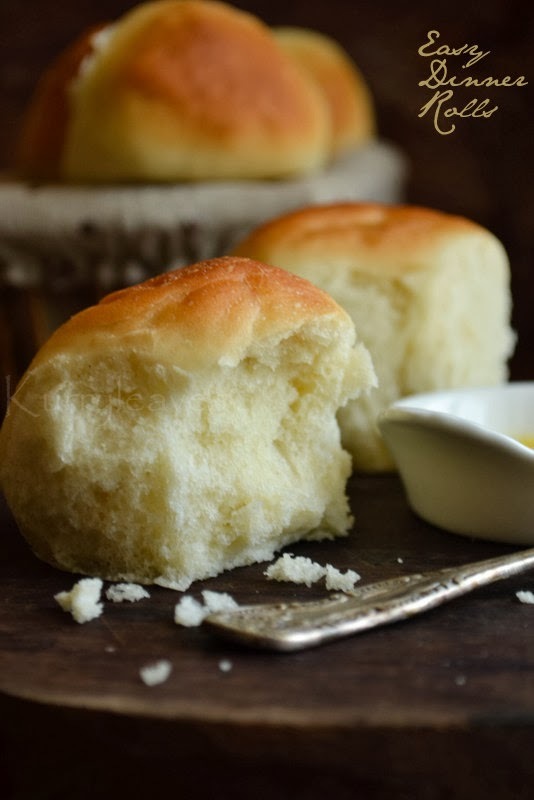 Learn how to make these light and buttery dinner rolls in about an hour. Recipe source:Inquiring Chef,you can find the original recipe here. In a large mixing bowl,combine together warm water,yeast and sugar.Keep aside for 5 minutes or until frothy. Add butter,salt and 2 cups flour, mix until combined. Cover the dough using a kitchen towel.Let the dough rise in a warm place until doubled in volume ,for about 20 minutes. Punch down the dough and turn it on to a lightly floured surface. Using a serrated knife cut the dough into two equal parts.Divide each half into 12 equal portions( i halved the recipe and divided the entire dough into 12 equal portions).With lightly floured hands,roll each portion into balls and place it on a greased baking tray ( 9 x 13). Cover using a kitchen towel and let them rise in a warm place until doubled,for about 20 minutes. 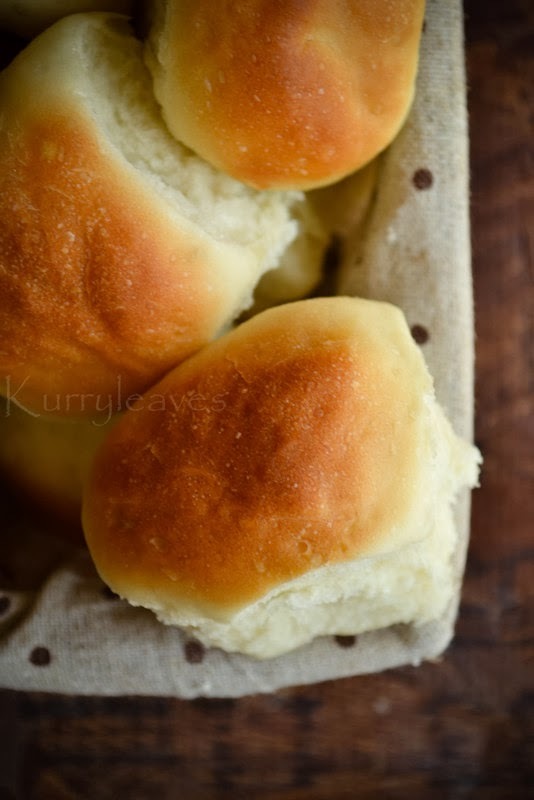 Lightly brush the rolls with melted butter.Bake for about 13 to 15 minutes or until it turns golden. 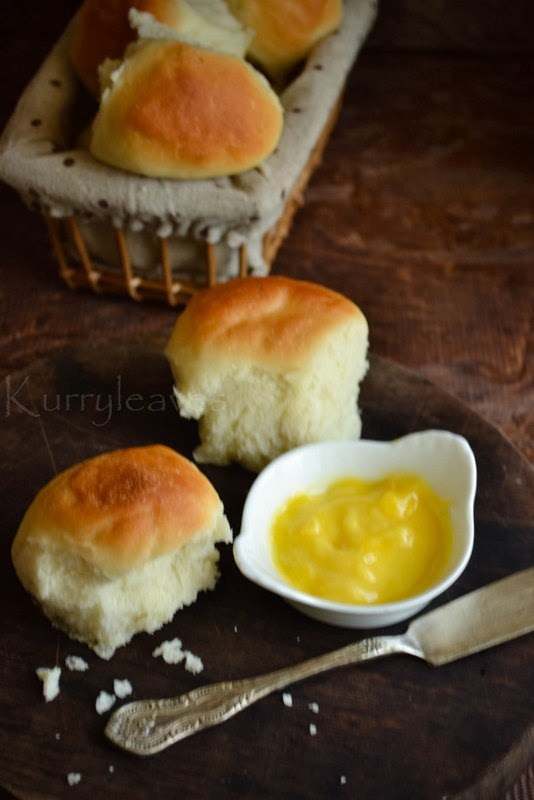 Immediately after removing the rolls from the oven ,brush them with remaining butter. I halved the recipe,and used 1.5 tbsp of sugar and it tasted perfect.Adjust the quantity of sugar according to your taste. Wow, these look amazing. Your step by step pics do give me encouragement: perhaps I too can venture into 'bread' making! It is a good thing I referred back to the original recipe before making these. Your instructions made no reference to the measuring of flour, which is pretty important in this recipe. The original recipe says to "lightly spoon" flour into cup and level off. That is a pretty big difference from how you normally measure flour-- which is scoop the measuring cup into flour and level off. That would give the recipe too much flour and the ratio would be off. Not everyone is a skilled enough baker to even the ratio back out. yes!! as you mentioned ..measuring the flour accurately is very important in this recipe,in order to obtain the perfect results.Too much flour can make the end product tough and dry. I have updated the recipe..Thank You once again....and im sorry:) okie!!! Well, as a pro at baking(and I tell people I am modest!) ok, well as someone with quite an experience with baking, I must tell you that for any, I repeat ANY recipe that uses flour, you always, I repeat ALWAYS have to spoon flour and never scoop it with a cup. This is very essential measuring 101 that very few sites mention. But the sites that do mention it, they make sure they emphasize it, like sallysbakingaddiction.com and Martha Stewart never forget to rub that spooning bit in. So NEVER scoop your flour unless the recipe asks for it. Hi Vidya! I have a question, for this recipe, what size cup did you use? Standard American(240 ml)? Or Indian(200ml)? Hi Meera! i use 250 ml (metric) cup. Thanks a lot for your detailed comment,im sure ..this will help the readers as well.Thank You!! Is it possible to use active dry yeast instead of instant? If so, are the amounts used still the same? I do not and never have used instant yeast. Thank you very much! Im not sure if my last comment posted but what if I only have salted butter? Amazing!!!! Thanks so much from Canada. 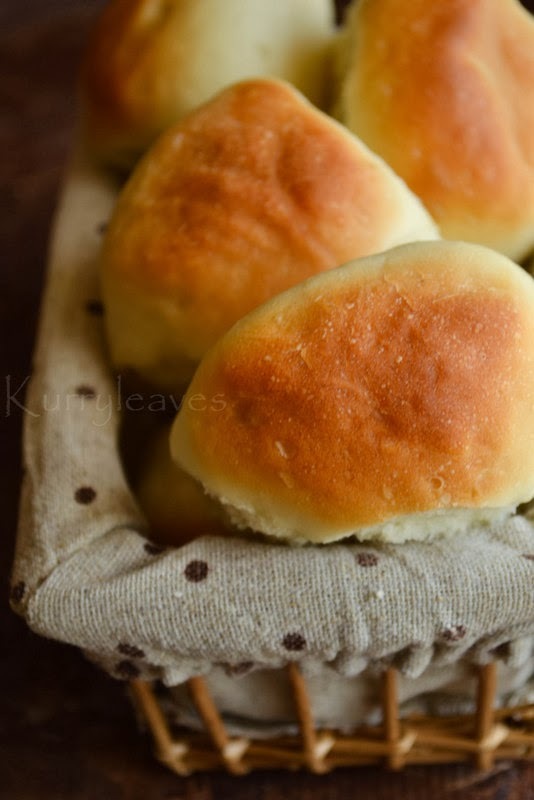 All the advices in the comments helped me too I made the perfect dinner rolls! can these be made ahead and frozen until ready to use? yes you can.....make sure you bring it to room temperature before baking.